Help achieve the objectives of the National Fish Habitat Partnerships and regionally based bird conservation plans (for example, North American Waterfowl Management Plan, U.S. Pacific Island Shorebird Conservation Plans, Intermountain West Regional Shorebird Plan, etc.). Enhancing native plant communities by reducing invasive species and improving native species composition. The Coastal Program is a voluntary fish and wildlife conservation program that focuses on watershed-scale, long-term collaborative resource planning and on-the-ground restoration projects in high-priority coastal areas. The Coastal Program conducts planning and restoration work on private, State, and Federal lands, and partnerships with other agencies—Native American Tribes, citizens, and organizations are emphasized. Coastal Program goals include restoring and protecting coastal habitat, providing technical and cost-sharing assistance where appropriate, supporting community-based restoration, collecting and developing information on the status of and threats to fish and wildlife, and using outreach to promote stewardship of coastal resources. The diversity of habitats and partners in Region 1 present many opportunities for conducting restoration projects. Faced with this abundance of opportunity, the Partners Program and Coastal Program must ensure that limited staffing and project dollars are allocated to benefit the highest priority resources and achieve the highest quality results for Federal trust species. 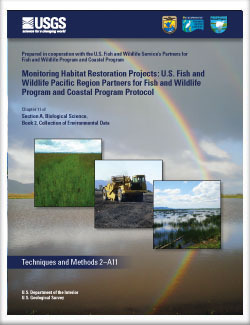 In 2007, the Partners Program and Coastal Program developed a Strategic Plan to guide program operations and more efficiently conserve habitat by focusing partnership building and habitat improvement actions within 35 Partners Program Focus Areas and 9 Coastal Program Focus Areas (U.S. Fish and Wildlife Service, 2010). The Strategic Plan also contains four other goals: broaden and strengthen partnerships; improve information sharing and communications; enhance workforce; and increase accountability to ensure that program resources are used efficiently and effectively. This protocol will help achieve all goals of the Strategic Plan. Woodward, Andrea, and Hollar, Kathy, 2011, Monitoring habitat restoration projects: U.S. Fish and Wildlife Service Pacific Region Partners for Fish and Wildlife Program and Coastal Program Protocol: U.S. Geological Survey Techniques and Methods 2-A11, 36 p.